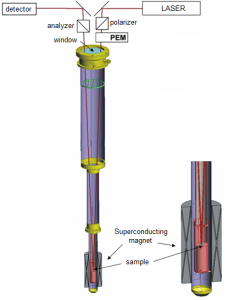 We developed a unique system to measure magnetic field induced polarization rotation and ellipticity up to B=14 T provided by a superconducting solenoid. Using a home-made optical insert the sample is loaded into a liquid helium cryostat. The temperature of the sample can be varied over the range of T=2-300 K. The optical path is composed of infrared or visible laser diodes, polarizing optical elements and a photoelastic modulator.